NetVizor Helps Resolve Most Employee Problems! Are you having problems with employee productivity? NetVizor employee monitoring software will help keep your employees on task, on schedule, and it will let you know if there is a serious issue within a day of use! Now fully Windows 10 compatible! Wondering how your staff is using their time at the workplace? NetVizor will show you, in full detail, how they are using the computer and Internet. If you need to block access to distracting social media, news or other sites that violate your terms of employment, you can! 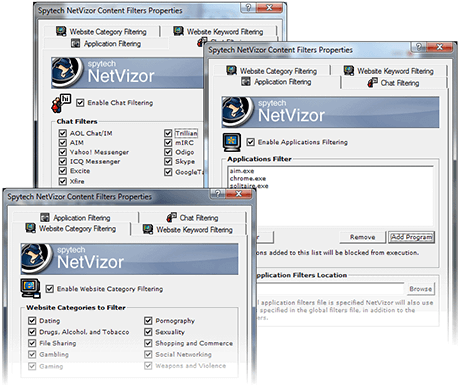 If you need to block applications like games, chat services and music, just set them in your NetVizor preferences and they will be blocked. NetVizor gives you the power to see exactly how employees are using their work time allowing easy elimination of unwanted behaviors and time-wasting activities. You'll know how your employees are using their computer. From Internet to application use, you'll have access to full details for easy viewing. Need to filter Facebook or Twitter? Need to block access to or filter out sites by category? Want to block searches by keyword? NetVizor makes it easy! Rather have your data on your internal network instead of the cloud? 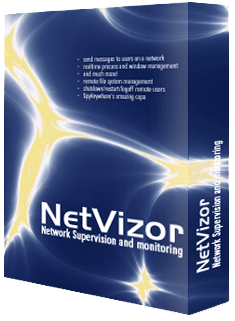 NetVizor is a centralized monitoring solution that resides inside your network! NetVizor records anything your employees do on the network. NetVizor comes with an unparalleled task recording feature-set that in secret records everything employees do on your network. 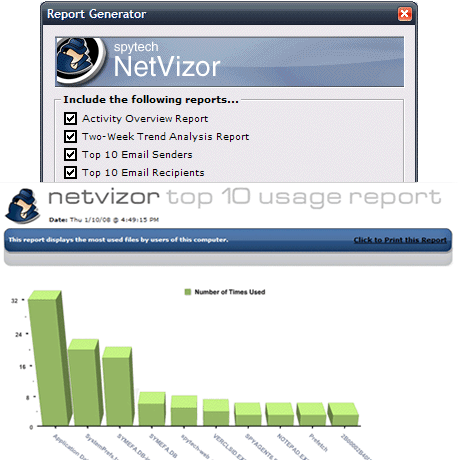 Chats, keystrokes and emails, site and on-line search activity, application usage, file usage, uploads and downloads, computer software setups, and web traffic represent simply a sampling of the NetVizor activity recording capabilities. Visual proof of all network behaviour is recorded by the NetVizor built-in screen capturing and playback. NetVizor not only records every thing users do, but in addition, enables you to remotely connect to user workstations and see what they truly are doing in real time. Innovative action tickers, tiled visual overviews, and internet-based remote administration capabilities enable you to see what exactly is happening at any time, and give you the power seize control of any computer in your network if the need arise. See what everyone is working on with the Real-time Activity Ticker. See every computer with a single click with Visual Network tools. View Keystrokes in real time as they are being typed. View Computer Utilization in real time while users work. Takeover network computers with Remote Desktop Control. Save time and identify problem areas quickly. NetVizor's step by step activity logs could be rapidly processed for easy viewing in the type of graphical top 10 activity reports, trend analysis summaries, and complete activity breakdowns. Reports can be generated for individual users, or for your whole network, and can be automatically generated on a regular basis and emailed to you for off-site evaluation. See what users are the most active and what activities are the most common with only a couple of clicks. Top 10 Most Active Users. Top 10 Most Inactive Users. NetVizor can behave as a proactive network security remedy, blocking unauthorized and unwanted activities in your network, while alerting you in real-time when they transpire. 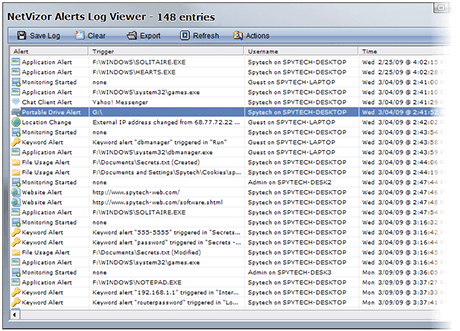 NetVizor logs every thing that the user has been doing, making a chain of proof of any unauthorized conduct. Ever wonder how much money is being lost due to distracted unproductive employees? View our Cost Benefit Calculator to get an idea! Improve productivity by blocking access and secure your network with a simple configuration. NetVizor was made with your network in mind. Rapidly scalable to fit the needs of your business. NetVizor is made to function on networks of all designs and sizes - from small single-subnet networks to huge 10,000 computer networks comprising multiple subnets and divisions. 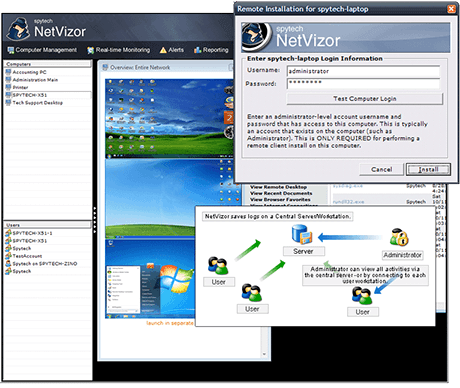 NetVizor is driven by an instinctive graphic interface that enables you to centrally install the NetVizor applications to workstations, record actions in your system, screen in real-time, and create reports all in one place with only several clicks. Combining all of NetVizor's powerful capabilities into one package gives you the power to secure your network, protect assets and prevent users from doing risky or unwanted behavior. NetVizor alerts can be sent in real time allowing administrators to react quickly to network events. Use NetVizor's logs as proof of what happened. Use NetVizor's lockdown feature to schedule lockdown periods so employees cannot use network computers at certain times. Try to Use a Portable Drive. Startup or Shutdown the PC. Types a Keyword or Phrase. Use or Modify Specific Files. NetVizor will alert you based on triggers you configure. You'll have instant alerts access to know if there's an immediate problem. With NetVizor, we have your entire network covered. Whether you have just 5 PC to monitor or 25,000, NetVizor was developed with your network in mind. Have a question? We'd love to help you, just submit a quick support ticket or look through our NetVizor Help Section. 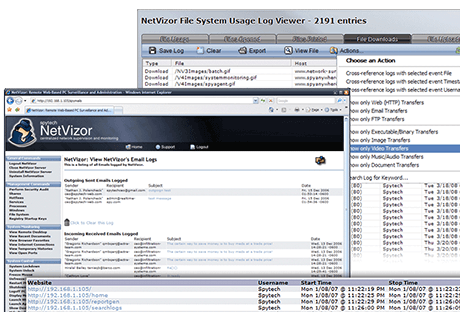 NetVizor is an employee monitoring software. If you need to monitor just one or two household computers, you will want to look at our SpyAgent review or Realtime-Spy review for the best monitoring software product for that use.